See It. Scan it. Cut it! The world's first home and hobby cutting machine with a built-in scanner. 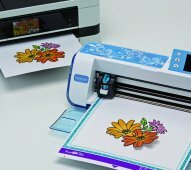 The secret to ScanNCut's amazing versatility lies i the 300 DPI built-in scanner, making ScanNCut the only cutting machine that can take your scanned images, photos or hand drawn sketches, and turn them into unique cutting designs, without the need or expense of a computer, software, or pricey cartridges. Using the included 12"x12" cutting mat, or the 12"x24" cutting mat, easily create and cut a wide variety of designs! -Editing is quick and easy! -Customize by changing shape size or position! ScanNCut lets you add seam allowances in 1/4" increments! And you can utilize the erasable pen to create sewing guidelines on your designs to assure virtually perfect placement of your stitches!